Top left: Maree Bento; Rose Red. Bottom left: Sanjay Singh; delivery notification from Mitchell Osborne. 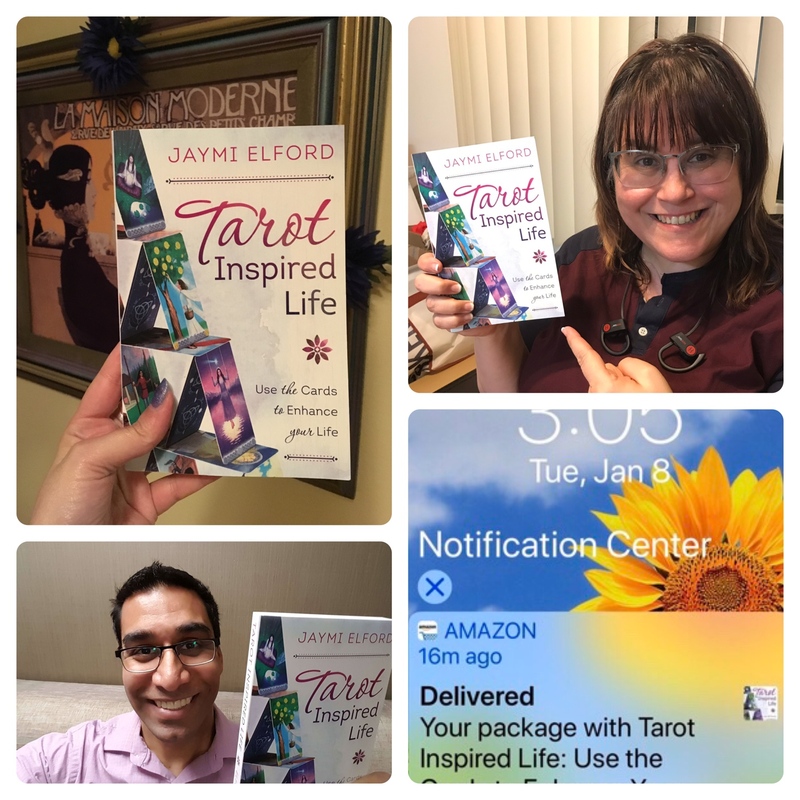 It’s been one week since Tarot Inspired Life came out. I’m happy to say that the book has been well received. The header image for this post is by kender and was taken at one of the two nearby Powell’s locations. It’s a dream come true to have a book of my own on their shelves. As you can see, TIL is in good company. I’d like to thank everyone at Llewellyn for giving me this opportunity! Barbara Moore, who championed my book; Laura Kurtz, my editor; Shira Atakpu, the talented artist who came up with a brilliant cover design; those who did the interior layout; and the publicity department including Kat Sanborn, Jake-Ryan Kent, and everyone else. It takes a community to make sure everything is done right and by golly, my book really does shine. Thank you to everyone who has reached out and shared your kind messages, images, and reviews with me. I’m excited to see how the book is expanding your knowledge and your daily practice. The collage contains four fun images kindly shared to me by friends who gave me permission to use them for this post. I know several people who are going to use the book for their tarot groups. Whether it’s for studies, or a read-along, I’d love to help you out with your goals. I have a generic reading guide here on this site; however, if you have specific needs, contact me and let’s see what we can create together.